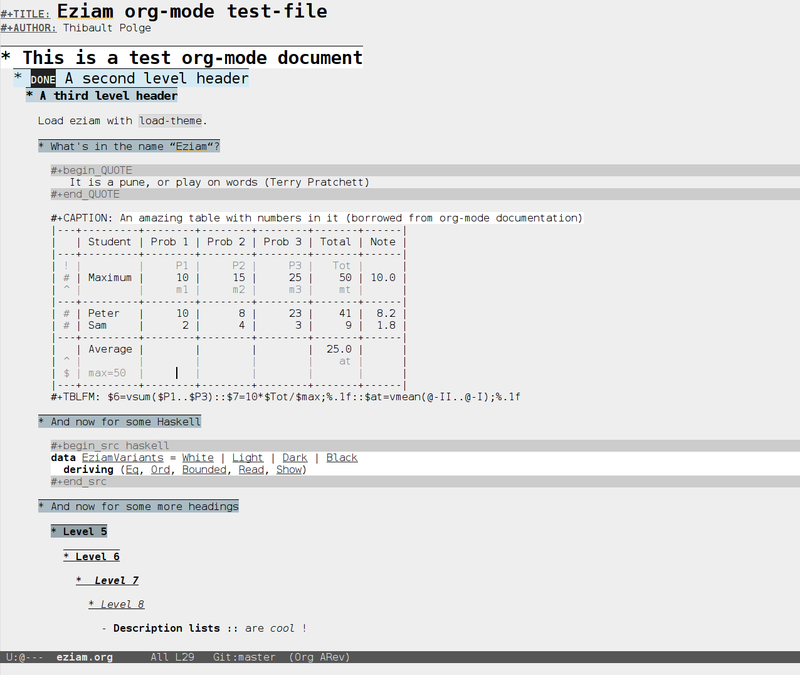 GitHub - thblt/eziam-theme-emacs: A mostly grayscale theme for Emacs, inspired by Tao and Leuven. 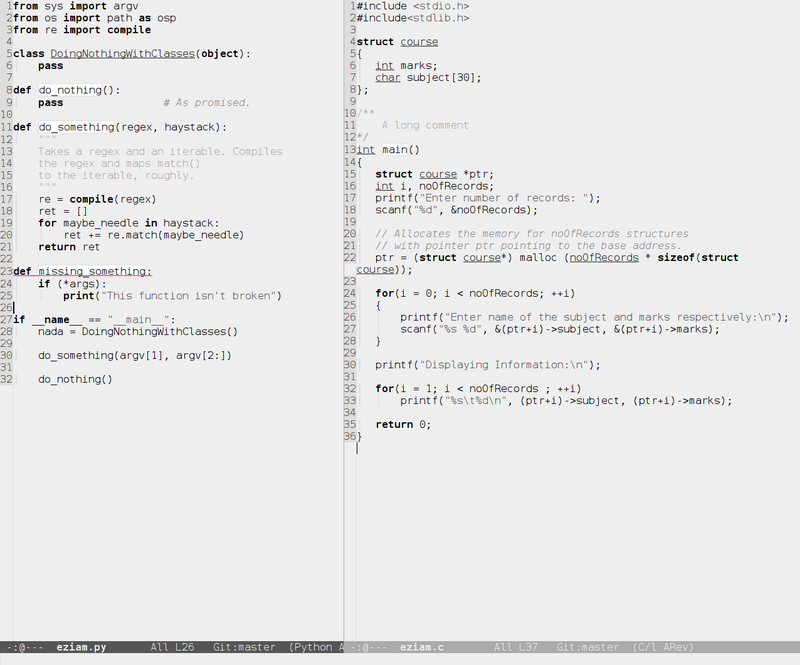 A mostly grayscale theme for Emacs, inspired by Tao and Leuven. Want to be notified of new releases in thblt/eziam-theme-emacs? 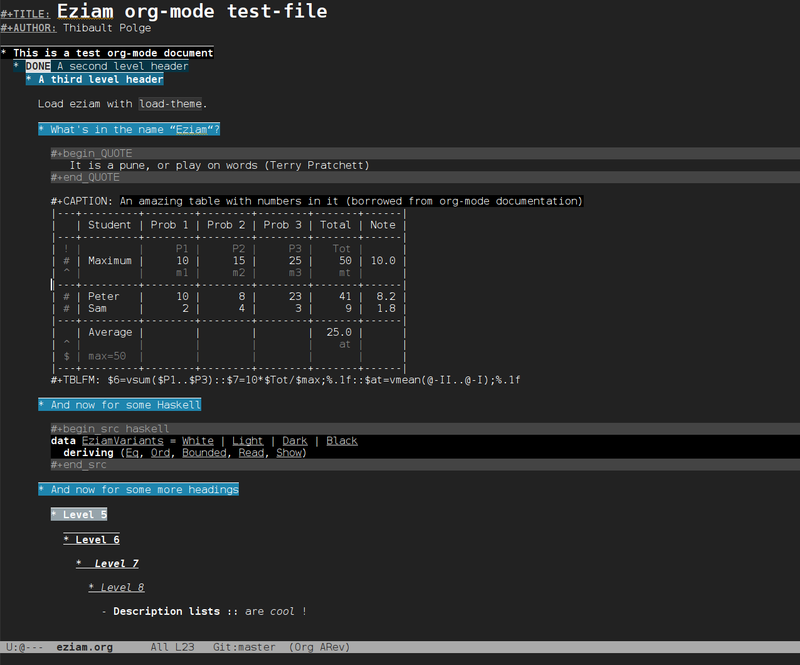 Eziam is a theme for Emacs, which tries to combine the simplicity of Tao with the org-mode goodness of Leuven. Unlike Tao, keeps some very minimal color indications, while remaining mainly grayscale and trying to avoid the “angry fruit salad” syndrome. 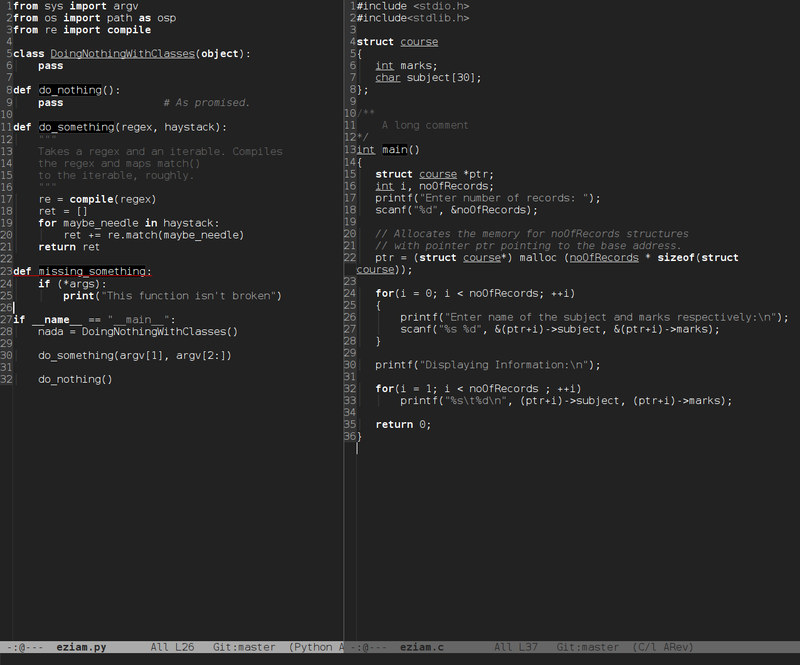 Unlike Leuven, it remains mostly grayscale, with no color for syntax, and easily allows multiple variants. 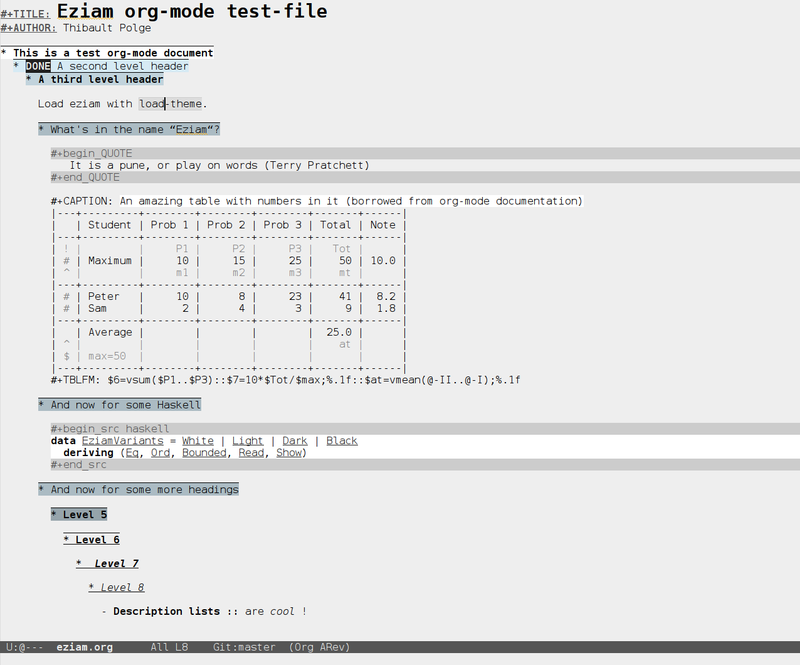 Eziam is really new: ideas, suggestions and bug reports are very welcome, either by creating an issue here or through e-mail at <thibault AT thb.lt>. Thanks! Both the Melpa and Melpa stable versions are actually stable and fit for daily use; experimental features are tested on separate branches. Eziam can be customized. M-x customize-group RET eziam-theme RET. Eziam is essentially a mix of two remarkable themes, Peter Kosov’s Tao and Fabrice Niessen’s Leuven. 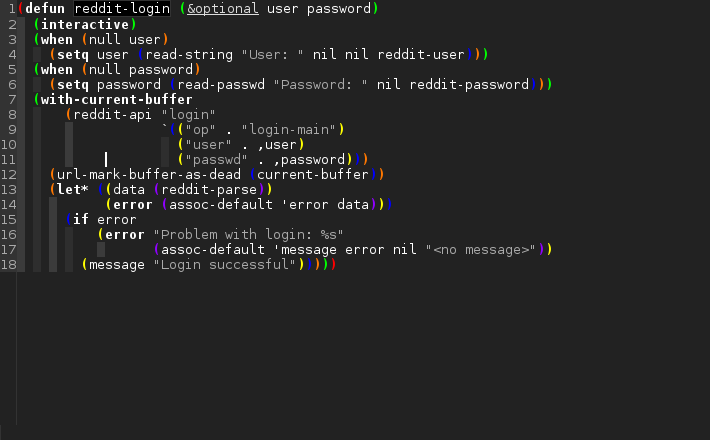 Although it is technically a fork of the former, it also borrows a lot of ideas from the latter, especially the “generic colors” logic (which may not be original, but as an Emacs Lisp beginner, that’s where I found it) and, of course, the great org/markdown outlines. The name “Eziam” is an extraordinarily bad pun, which I feel like I probably shouldn’t explain. If you don’t get it, you’re probably OK.